The helmsman on board Hoshi steers with an eye on the luff of the tops’l. Indeed, the cruising of a boat here and there is very much what happens to the soul of a man in a larger way. We set out for places which we do not reach, or reach too late; and on the way there befall us all manner of things which we could never have awaited. We are granted great visions, we suffer intolerable tediums, we come to no end of the business, we are only out of sight of England, we make astonishing landfalls – and the whole rigmarole leads us along no whither, and yet is alive with discovery, emotion, adventure, peril and repose. On this account I have always thought that a man does well to take every chance day he can at sea in the narrow seas. A Provident crew in relaxed mood, cruising towards Belle Isle. Sailing in light airs, some unorthodox canvas has been set. The British have a certain talent for devising institutions which are a remarkable variation on a common theme. For instance, many countries have seasons of concerts, but they have nothing like the Proms, or the last night of the Proms. Many armies have elite ceremonial corps, but not a Trooping of the Colour. There are other ancient and elite universities in the world, but none remotely like Oxford and Cambridge. One can multiply the examples, state, academic or cultural. Take Yacht Clubs. There are clubs, ranging from the exclusive and the expensive to the cheap and cheerful, all over the globe, including third world countries. The Island Cruising Club is yet another British variation on a theme. The Centre Nautique de Glenans, the Sail Training Association and the Ocean Youth Club all have some degree of cousinship, But the OYC has by definition a different kind of membership, and also a different style. The STA has objectives all of its own, Glenans has an approach and methods as different as you could expect from the French. The Island Cruising Club is entirely individual in its objectives, its approach and its style. This is not surprising as the original concept was that of an individual, one John Baylay. 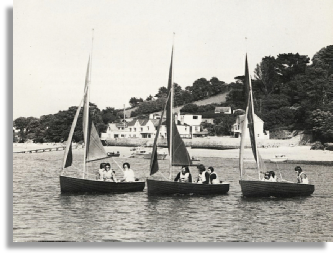 At Salcombe in 1951 he had behind him a general experience of yachting and experience in managing a sailing school. As a result he formulated two objectives for a new enterprise. One was practical, the other might be deemed moral. The practical and the moral working in harness are ever a formidable combination. The practical objective was to provide cruising on a Club basis, using Club owned and operated craft. John Baylay recognised then that there were many people, young and old, who would like to go cruising but for one or more reasons were unable to do so. It might be lack of money and time to maintain a boat, or lack of expertise in venturing out to sea. Or it might be distance from tidewater or a suitable cruising ground, limiting sailing to a week or two in a year. Club craft operated on a co-operative basis would solve all those problems in a highly cost-effective manner. The second objective was based on the idea that the service of providing sailing should not only be commercial but should positively seek something more than just teaching people to sail. They should be trained to become members of the maritime community, embracing both amateur and professional sailors. Thirty years on it is a fair assumption that the former much outnumber the latter. Membership was to be open to all comers. On the “open university” principle there was no bar in age, qualifications and experience. Thus a retired Admiral might find himself going to sea with a nursing sister who aspired to become a top cruising skipper (and became so). A young man with an Extra Master’s ticket might be in a watch with a man who had previously been only an armchair sailor. A round the world yachtsman might find in his crew someone who had not before ventured beyond the Serpentine. All could find something to learn. Thus from the beginning the Club has always had a considerable instructional and educational element. Its system of certificates is now merged with the RYA Syllabus and it is recognised as an RYA Teaching Establishment. At the same time it has never set out to be some great maritime pedagogue, with young cadet members fed in at one end and coming out monotonously at the other as Yachtmasters or RYA Instructors. Therein lies one of the very individual characteristics of the Club. Sailing is something to be enjoyed as a recreation and another dimension of life, not a sport with everyone aspiring to the status of the next higher grade of expertise. The spirit is of Belloc. There is more to being a Club member than paper qualifications in seamanship. The Club’s system works on a “low pressure” rather than a “high pressure” basis. To implement the idea of the Club in 1951, John Baylay and his wife Beth needed a considerable measure of finance and a very small group of people who would direct the Club’s formation and its activities. The amount of money required was substantial, but friends rallied round to raise it. It must be remembered that back in 1951, when it meant risking money, idealistic ventures were not received as favourably as in more recent years. There was still a Victorian attitude that anything that was not hard-nosed business was naïve and lead to a foolish waste of good money. Moreover Britain was only just emerging from the aftermath of six years of total war. Since 1945 the economy of Britain and Western Europe had lurched and staggered, relying heavily on American aid and the Marshall Plan. Britain had gone through a serious relapse of the economy in 1947. Bread rationing had had to be introduced after the war ended and in 1951 meat was still two years away from the end of food rationing, In the same year the Festival of Britain was launched in order to boost the country’s morale and to try and restore its economic and cultural self- confidence. Thus the initial financial achievement should not be thought of just in today’s terms. For the first year the only practicable way to float the Club was as a proprietary club. commercial start lingered on as an after-image in the minds of many and it was some years before it was finally dispersed. One of the first people to ‘read’ the Club correctly was Francis Usborne, Secretary of the RYA, and a considerable debt is owed to him and Nigel Hacking for their support. The founding members who achieved the launch of the Club were John Baylay and Beth, with Anne Melville and Helen Shaw; joined shortly afterwards by Des Sleightholme and his wife Joy. It will not escape notice that in this group woman were in the majority! By good fortune there lay in the harbour at Salcombe at this time an ex-Brixham trawler Provident of 78 tons TM, which for twenty years had served as a yacht, at one stage under the American flag. She was for sale to a good cause and was duly purchased. With accommodation for about fifteen people and the highest sea-keeping ability she was an ideal craft. But it was soon recognised that some people might wish to have initial sailing instruction in dinghies and this would bring in additional income. 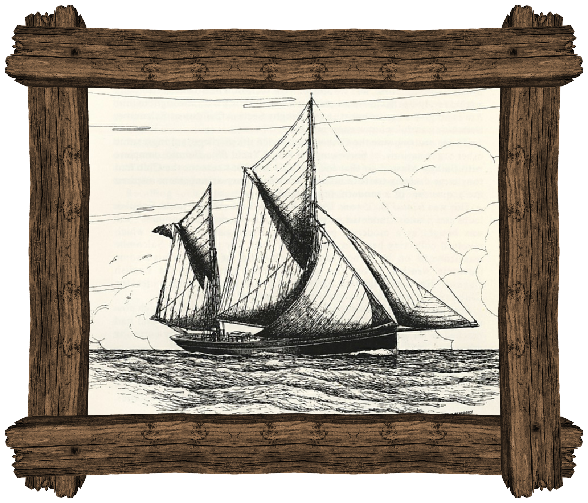 Some clinker built 13-footers, which would stow on deck on Provident, were therefore constructed. Some are still in service thirty years on. Initially Provident cruised one or two weeks and acted as a dinghy base the next week, alternating in these roles with the Schooner Hoshi. Yet another Brixham trawler, Rulewater, generously lent by Major Rainey, was made available to the club, and is doubtless still remembered by some for her formidable tiller steering. 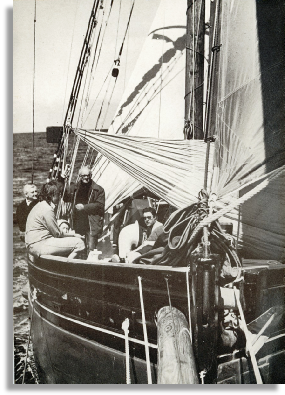 A chance meeting between John Baylay and the late “Chunky” Duff, a well-known figure in yachting circles, led to the acquisition of the Edwardian schooner Hoshi of 50 tons TM, in February 1952. Very properly some Club legends have accrued to this splendid vessel; one that she was built for Admiral Beatty and another that she originally had a steam auxiliary. In fact she was built in 1908 for J Oswald and owned in the thirties by Beatty’s elder son. The engine was where the spacious double after cabin is today, and she was one of the earliest yachts to have an internal combustion auxiliary! Although her rig had been somewhat reduced, the accommodation for a dozen people or so made her ideal for the Club’s cruising. Doubtless in years to come there will be a further legend that she was built for Lily Langtry’s husband, based on the fact that she appeared prominently in the TV series on that lady. In the initial stage the Club’s administration was fairly rudimentary, but in the first season as a proprietary club had to deal with 350 members. 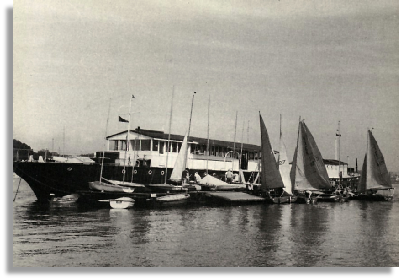 The establishment of the Club as a Members’ Club, with subscriptions and sailing charges, dates from October 7th, 1952. At the same time it became a legal entity, as a Company Limited by Guarantee, and with an elected Committee. John Baylay devised a rallying cry, which if the Club ever adopted a formal motto, would deserve that place – “Don’t just stand there, do something!” It served well then, and still does today. 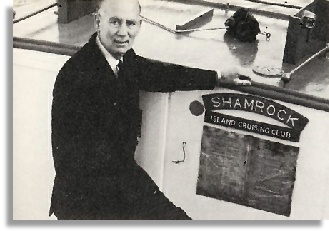 The first office was in the Boat Store in Island Street, and later in the then then Custom House on Custom House Quay. Subsequently it moved back to Island Street again, in the present premises. ‘Island’ seemed an appropriate name for the club on all counts. The name of the street is derived from the North Oarstone, which lay near the present Cove’s yard. After 1850 land was reclaimed from Shadycombe Creek and the Club’s properties stand upon made ground. Shore property, offices and office equipment have never had first call on the Club’s resources; which has generated one of the Club’s present problems. As late as 1955 the Club was appealing for a full size typewriter. The existing portable, on loan from John Baylay, was wearing out and had become too feeble to cut stencils! Office equipment might be a bit limited but by the mid fifties the Club had acquired over 800 members and had emerged, in all essentials, recognisably in its present form. There were Flag Officers and an elected Committee, some paid staff and a Secretary, who managed the Club’s affairs. In the earliest years everyone was on a more or less honorary basis, but this Utopian state of affairs could not be expected to last and the beginning of a pay structure came in 1954. But for many years to come pay to full time working members was based on the principle that they were paid the minimum amount with which they could manage their lives. There is now a formal, graded pay structure for staff members; nevertheless it remains true that present day Staff members do not find the prime attraction in working for the Club to be financial! 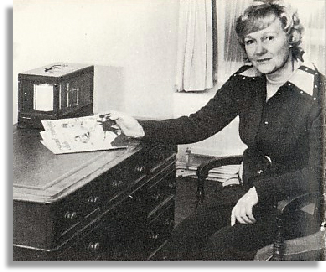 The first Secretary was Helen Shaw, who held the fort very much on her own. She was succeeded by Harry Nicol, then followed Anne Snow, who was succeeded by her mother, Octavia Snow OBE. In 1956 the late Angus Primrose, A.I.N.A, was in the chair. 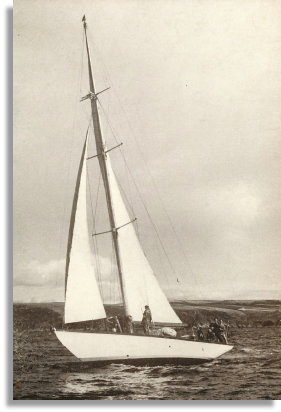 He went on, in later years, to design Chichester’s Gipsy Moth IV, and sadly, was lost at sea off Florida in 1980. He was succeeded by John Hobbs in 1957, who was followed by Ted Pearce in 1961. In the same period the operational form of the Club was also consolidated very much into its present form, although on a smaller scale. By 1956 the regular cruising fleet consisted of Provident, Hoshi and the Nicolette, of 24 tons TM. It had been found necessary to retire Rulewater in 1954 and she became an accommodation vessel for the Dinghy Section, located in The Bag. A rather bewildering maze of cabins was constructed inside her, the most cramped and gloomy being known as “The Death of Nelson”, from its resemblance to the cockpit of Victory! 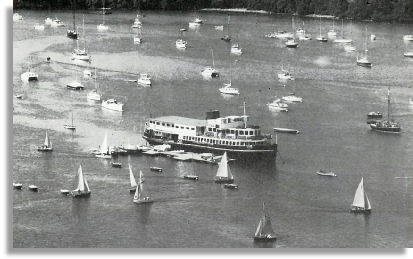 Ilton Castle served from mid 1952 as the first regular dinghy sailing HQ, adapted for the purpose, but she had to be replaced by an ex-Motor Gun Boat, Kiwi. 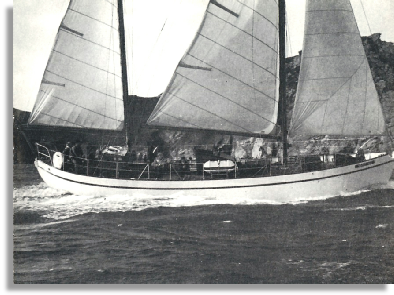 The most eccentric vessel of this period, attached to the Club, was the double ended Bermudan steel schooner Darlie. Since her masts were both of the same height it was often impossible for observers to determine which way she was heading. The wheel had a full turn of play on it, so that those on board were not sure either, particularly after the variable pitch propellers had done their worst. Her saloon boasted a double bed and a piano, calculated to satisfy the basic desires of any proper sailor – that is, sleep and some music. The third arm of the Club, established in the fifties, consisted of the regional Sections – London, Midlands, Northern, and lastly Western, based on Bristol. Their object was, and is, to provide a link between the Club, based at Salcombe, and its members scattered all over the country, with the heaviest concentration centred on London. Their main activities have been social in the winter and some degree of Sectional sailing from bases other than Salcombe. In the fifties the main routines and traditions of the Club were established ashore and afloat. A cruising boat is a little closed world. Watch rotas, brass polishing, housekeeping, cooking and various ritual routines once satisfactorily devised do not have to be changed. Skippers, mates and cooks got to know how to handle crews, and vice versa. Skippers learnt to identify those crew members who were on their way up to become mates and skippers, and also bright intelligent people who would make a mess of things with the headsails, because they were on holiday and had switched off the learning mechanism. 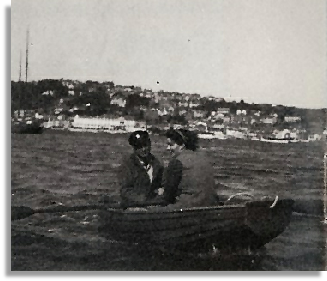 The Dinghy Section had to respond to new accommodation vessels, new types of dinghy, and ultimately the crowding of the harbour with moored boats. The personality of the Dinghy Master counted for everything. The administration had to cope with a growing Club and the Committee had the problem of making ends meet in changing conditions and with an ever present shortage of working capital. In the late fifties and early sixties some form of consolidation of capital assets was the order of the day. John Baylay repaid those who had provided the initial capital for the purchase and loan of craft. It was now the turn of the Club to repay in effect interest free loans from John Baylay. In 1958 Kiwi was almost complete as an accommodation vessel and the mortgage had been paid off. In the same year Hoshi came into the Club’s ownership, but mortgaged up to the bowsprit. Provident and Nicolette followed suit, but the mortgages were all paid off in a few years. 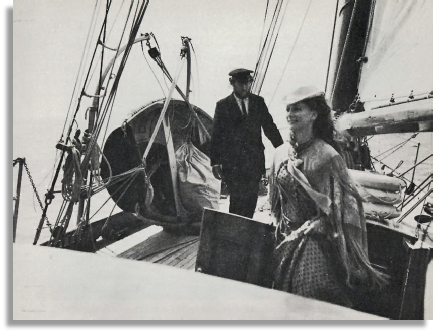 In the early sixties the Club also had, on loan, the Bristol Channel Pilot Cutter Marguerite, famous in her time for racing. In 1959 Astra, ex RAF, was acquired as a further operational base for the Dinghy Section. Two years later total membership had reached 1500 and a Sailing Section and cruising base was established in the Solent, using Westward, a steel-clad ex-Landing Craft (Infantry), which had been very well converted by its previous owner as a house-boat. Boleh, an eccentric Malaysian-built Junk, was stationed in the section. The Solent Section was a good try, but perhaps ahead of its time and Westward was brought to join Kiwi and give a major boost to the Dinghy Section facilities at Salcombe, both being in full commission in 1964. 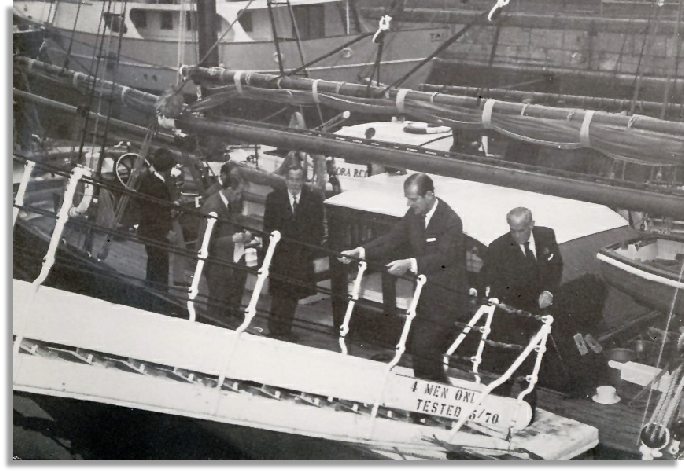 On the cruising side the Club was accorded the privilege, amongst some other organisations, of borrowing the Royal Yacht Bloodhound, complete with Sailing Master, so that for the 1963 and 1964 seasons the Club had four large cruising units in action, this temporary arrangement inspired the acquisition of a modern, fast, cruising boat. This was Irina VII, 25 tons TM, built in 1935 for cruising in the Scottish lochs and islands, under the name of Sonas, the Gaelic for ‘happiness’. She was bought at a moderate price from a Norwegian shipowner, which involved collecting her from the Bergen fjord. The passage to Salcombe was frowned on by some Norse sea god and the crew endured some fearsome weather before the god’s influence ran out at the English Channel. Her sloop rig, with 70-foot mainmast, was deemed not ideal for Club cruising and she was altered to the present ketch rig. Bergen remains the northernmost limit of the Club’s cruising, which now regularly includes the Western Isles, and, with luck, St Kilda; and had reached as far south as Lisbon in 1956. The Baltic was added as a cruising ground in 1966. In the 1967 Club Journal the Commodore seemed to be seriously worried about the state of the economy. In 1981 it is hard to imagine what he can have had to be concerned about then, compared with now! At any rate the Club continued fairly smoothly on its way for the rest of the sixties. Thirteen footers sailing in convoy down the harbour. Race to La Corunna and succeeded in winning Class B, Division 1, with an all-girl crew. The subsequent return to Salcombe was a scene of triumph and helped establish the Club more firmly as an accepted institution in Salcombe. Even after nearly twenty years new Clubs are not too easily approved in the West Country! The Club reached a zenith in its fortunes with Hoshi in August 1970, followed at the end of the month by a disaster in the Bay of Biscay in an extraordinary and not easily explicable accident. On the night of August 26th Nicolette was proceeding peacefully off Sables d’Olonne when a French trawler, which had been in sight for some time, passed clear ahead. Suddenly the trawler did a more than 180 degree turn and rammed Nicolette in way of the main hatch. The yacht sank in twenty seconds and three of the watch below went to the bottom with her. Back in Salcombe the Secretary, Ted Pearce, was awakened with the news in the early hours of the morning. Unfortunately the Commodore, John Baylay, was on holiday in a remote part of the Mediterranean. For some time he could not be contacted and return to Salcombe was not easy. The Administration took the shock. On the one hand relatives of those drowned had to be contacted and supported, on the other the French bureaucratic machine had to be dealt with and the immediate interest of the media contended with. The survivors had to be brought back and the bodies of the victims recovered from 100 feet down and returned for burial. Subsequently the possibility of mounting a salvage operation was agonised over and rejected. With twenty years of existence and tradition behind it, the organisation took the strain; but it was a traumatic experience for those closely involved. Recalling such a disaster is an unhappy task for any Club historian, but to fail to do so would be less than honest and show a sad lack of confidence now, when confidence was not lacking immediately after the event. 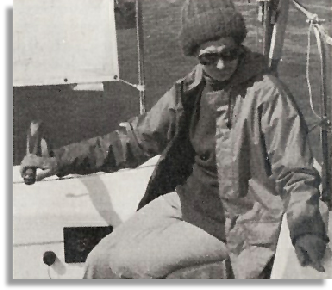 The loss of Nicolette left a serious gap in the cruising fleet for 1971 and a replacement was going to be hard to come by despite insurance payment, compensation from the French trawler owners and a Club fund, for which there was a notable contribution from the Centre Nautique des Glenans. However, as at other crises in the Club story, help appeared unexpectedly. A man from another island offered a similar sized yacht for loan to the Club. The source was perhaps surprising to English thinking at that juncture, but then the English always find it hard to appreciate that Celts may have different thought processes from Anglo-Saxons! Nancy Bet, a vintage Hillyard ketch of 29 tons TM, soon became a firm favourite with many members and remained so until her owner was obliged to withdraw her in 1978, leaving the Club with a considerable debt of gratitude, of which a suitable token was presented. November, John Baylay retired from the post of Commodore, which he had held throughout the whole period, and became Founder-President. 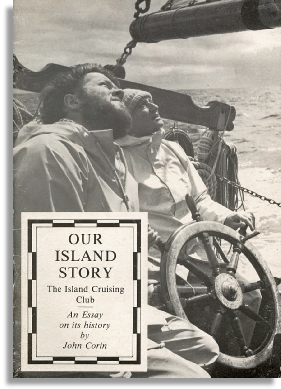 At the celebratory dinner in 1972, Des Sleightholme, a founder member and now Editor of Yachting Monthly, spoke in characteristic vein in tribute to John and Beth Baylay. He said of John’s foundation of the club that “he was given plenty of advice from people who were qualified to give it but thank heaven he chose to ignore it and go ahead. John is quite the most obdurate, and single-minded, pig-headed and indefatigable man I have ever known. It has meant, inevitably, that he has trodden on more toes than a lift full of footballers but who can lead without treading on a few toes? John is a leader”. Of Beth he said “if John has been the rudder to this ICC ship then Beth has been the pintle upon which it has rested for support in its endless turnings”. For an interregnum Sam Clark, who had been Vice-Commodore, held the post of Commodore after John’s departure. Sam had had long experience with the Club, including a spell of driving the launch! Before that his Island experience went back to commanding the artillery of the Island of Malta, G.C. – a man not easily daunted. Sam Clark was succeeded by Hubert Monroe QC, another Gunner, who like John Baylay, had served in the army in Burma during the war. He gained nautical experience by moving guns down the estuary. When on one occasion the Burmese boatmen fell asleep and succeeded in tipping the guns into the river he was suitably exasperated. The ICC was to provide comparable challenges. To the deliberations of the General Committee Hubert brought from time to time a touch of judicial reproof. However, just as the Irish know how to lace their coffee and then pour cream on top, so Hubert’s commentaries to the Committee, or the Club at large, were given a topping of Gaelic wit to smooth the bite of the spirit below. Not long after Hubert took the chair a formidable challenge to the Club organisation began to loom. The Dinghy Section headquarters in The Bag, at Quarantine Bay, had been formed for many years by Kiwi and Westward, joined by a floating bridge. Both had been built some thirty years previously for a very active but perhaps limited life, Kiwi as a Fairmile motor gunboat and Westward as a Landing Craft (Infantry). LCI’s were particularly prone to be regarded as somewhat expendable. Certainly a thirty year hull life was not in their specification. Time had taken its toll of Kiwi, and Westward had unfortunately suffered distortion from being put on the grid at Scoble Basin. To have either or both become unserviceable at short notice was an unacceptable risk. That decision was simple; how to replace them was not. For one thing they had both been purchased for a total of about £5,000 and even if they had been solemnly written down over the years for that figure it was calculated that £5,000 would be only about one fifth of the bare cost of a replacement vessel, never mind the cost of conversion. The Committee also had to face the fact that the cost of conversion could by no means be estimated until an actual vessel of whatever type had been secured. If the Committee had sought advice from those qualified to give it, they might well have been deterred. If they had known what the new enterprise would eventually cost in terms of money and strain upon the organisational resources they would have been utterly dismayed. Fortunately they did not and many similar enterprises in the world of voluntary or co-operative effort owe their success to similar sublime ignorance! The Committee were in a difficult market, because North Sea oil interests, with rather more capital at their disposal, were also seeking accommodation vessels. Some very large Trinity House pilot vessels with a good number of cabins were on offer, but although superficially an attractive answer they were nothing like as good for the purpose as the ex-Wallasey ferry Egremont. Fortunately considerable expenditure was needed on her engines, so she was hanging on the market – in fact in the hands of a scrap company. The 146ft long vessel proved to have ideal basic characteristics for conversion into a Club and Dinghy Sailing headquarters – large public rooms with big windows; spaces below, including eventually the engine room which could be filled with cabins, and deck space abaft the funnel which would take a deck of further cabins. The price, minus engines, was £25,000 – exactly the figure the Committee had allowed for. However, to complete the purchase, dry dock and remove such a vessel from a distant and complex major port like Liverpool was another matter. Local representation was vital and member Mike Allsop’s organisation came to the rescue with quite invaluable advice and assistance. The Club is greatly indebted to him and Captain Vogiatisz. In the case of the latter, Greek met Scouse scrap merchant and won that tussle and many others for the Club! Having solved the innumerable Liverpool problems the next one was towage round the coast of a “dead” ship – no light matter for any organisation. At this juncture member Roger Stevenson’s Avonmouth towage company came to our aid. It’s not what you know, it’s who you know! Just beating the arrival of some bad weather Egremont was brought to her mooring in The Bag on June 18th 1976. The worst problems were only about to begin! Kiwi and Westward with some of the Enterprises alongside. Westward is in the foreground. do was estimate the cost of conversion before a particular vessel had been selected and purchased. As there were very few really suitable vessels on the market, and of them Egremont was probably the best, the only course was in any case to press on regardless. Members rallied round and contributed money, materials, expertise and labour in vast quantities. Grants, loans and job creation scheme help were obtained. The timetable for conversion was from the summer to the following Easter. A prodigious period of activity, money raising and spending was embarked upon. The resulting period of activity stretched the Club’s resources in money, manpower and administration to the limit. Staff members, Flag Officers and General Committee members were severely tried and the whole organisation was tested like a wire hawser being strained to its limit with extremely dangerous consequences in view if the load proved too great. However the work was eventually completed, sufficiently on schedule, and the Club had gained a new Dinghy Sailing HQ with 90 berths, nearly 50% more than before. Also it had gained a vessel which could serve a number of general functions as a Club HQ, together with operational functions like serving as a victualing base for the cruising fleet under a Fleet Caterer. The eventual cost was in all over £100,000. A probable dockyard cost would have been two and a half times as much. But some new problems were generated. Kiwi and Westward, despite their original war purpose had been essentially what might be deemed glorified houseboats. Egremont was a proper ship, with all the attendant requirements of maintenance and organisation for those on board, particularly in respect of emergency procedures. Moreover the Dinghy Section, by reason of the increase in numbers catered for, had moved into a new league in terms of size. Some three years on the Club has had to tackle the problem of its shore base, without which the floating sections cannot operate. Ultimately the resources of victuals, fuel, maintenance and administration must be derived from the shore. Nevertheless the Club had always given low priority in expenditure to matters like office accommodation. Office conditions, particularly, were approaching the intolerable and the condition, layout, and capacity of the maintenance and store premises in Island Street, left, and currently still leave, much to be desired. During the winter of 1980 about £40,000 has been spent on improving the office, laundry, shower and heads accommodation. About half the sum was raised by members and half from loans and grants. A further plan has been devised for the maintenance and store properties. 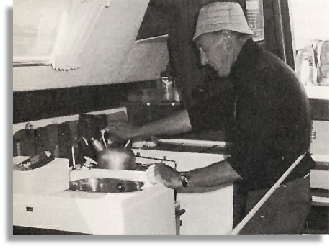 In 1978 Hubert Monroe retired from the post of Commodore, having served a longer term than he had first intended. During his term, in the role of Lawgiver, he had given the organisation “The Green Book”. This Handbook for Committee and Staff Members is concerned with job descriptions, conditions of service, administrative structures, and, very importantly, the separation of powers between Committee members and those Staff Members with executive responsibilities. This separation between the board and the executive is, of course, well understood in all companies, but in a club co-operative where the members of the board participate in the activities on a day to day basis the separation needs careful maintenance. Hubert Monroe was succeeded by the present incumbent, Jack Cawthra. The General Committee is not easy to run, if for no other reason than that the members have a far greater direct and lively experience of the matters in hand than many company board members have of the businesses they direct. It might be prudent at this point to emphasise that the opinions expressed in this essay are solely those of the author! Differences of opinion are not an uncommon feature of the Club’s running. After all many of those involved are accustomed to making their own decisions at sea and do not always prove to be conformists on shore. It would be entirely idle to deny that there have been clashes of personality even at various crises in the Club’s thirty years. It would be strange if it were not so. Often the sound of clashing opinions is the mere hammering out of a better forged policy than might have been achieved by some cold moulding process. 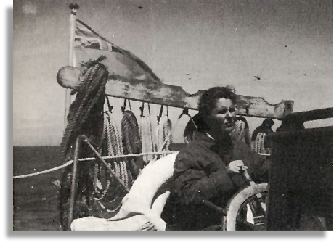 Irina VII in her original sloop rig. In the 1980 season the gap left by the departure of Nancy Bet was filled by the addition to the fleet of the splendid ketch Lucretia, 35 tons TM, and later in the season, in preparation for 1981, by Speedwell of Cremyll, a lovely yawl of 23 tons TM, ideal for Club cruising. The Club had learnt right at the beginning that, as in the world of commercial shipping, it is not necessary to own a vessel in order to operate it. In fact most of the Club fleet is Club owned, but Lucretia and Speedwell are on loan/maintenance agreements, which give the owners a measure of usage in the year. It is an arrangement which suits everybody. Back in 1972 the Club sold Provident to the Maritime Trust, who have made themselves responsible for her long term preservation, while very generously chartering her back to the Club, so that she can continue in a lively role. The Club is expanding into the provision of small cruising boats for short courses, including introductions to cruising for those going to the Greek islands for their sailing. At the end of 1980 the General Committee was seriously considering the problem of the size of the Club. Successful expansion brings as many dangers as less successful states. For a close-knit organisation, a co-operative run by its members for the benefit of its members, optimum size is a vital consideration. The relationships between people require constant vigilance and the total number involved at Salcombe at any given time can be critical. Des Sleightholme, speaking at the 21st Anniversary Dinner, put it very succinctly, if in somewhat robust terms. Speaking of the Club in its very early days, he said – “it was small, and it was poor, but it had fire in its belly. May it never grow so big and so important that its belly hides the ground on which it was founded”. Whatever size it might be the Club has never suffered from having a bellyful of money! The present and contemplated shore property expenditure will strain finances to the limit. However, the Club has seldom held back from carrying out any vital project through the mere absence of any money in the bank. Decisive steps have been taken at various junctures on the basis of faith in the support of the membership and that faith has not been found to be misplaced. Faith is something which the accountants cannot show in the balance sheet. As Belloc remarks – “any venture connected with the sea is full of venture and can pretend to be nothing more”. So the Club is a venture and is very conscious of the absolute necessity of maintaining its traditions and the “Club spirit”. Admiral Lord Cunningham once remarked to the effect that while it might take three years to build a ship it took three hundred to build a tradition. It is not given to many institutions even national ones, to have three hundred years at their disposal, but perhaps the Island Cruising Club can, without hubris, allow itself the thought this year, that in thirty years it has built something of a tradition in Salcombe. Our mentor, Belloc, supposed Salcombe to be the happiest harbour in the world. For the members of the ICC that must be so.